Month of March was highlighted with two holy festivals at the Ashram. Srimad Bhagvata Katha (in Hindi) – (March 16, 2007- March 23, 2007) A week long Srimad Bhagvat Saptah (in Hindi) was organized at holy Sri Ashtalaxmi Bhavan. 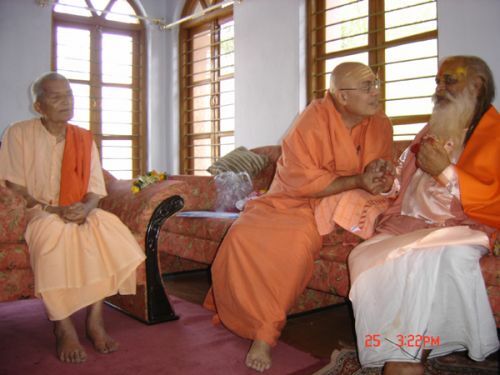 H. H. Sri Swami Adhyatmanandaji Maharaj was on Vyasapith. All the devotees had a wonderful experience listening to the glories of the Lord Sri Krishna . 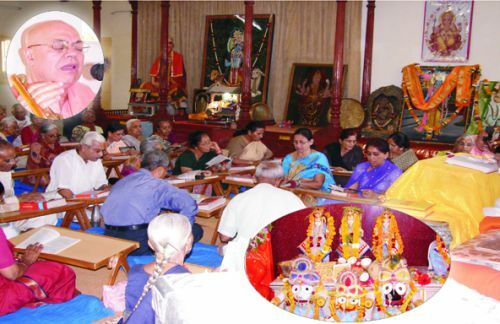 Sri Ramjanmotsav (March 19, 2007 - March 27, 2007). During holy Chaitra Navratri, nine days of Sri Ramcharitramans parayana was organized at Sant Kutir of the Ashram. Large number of devotees participated in reading of holy Sri Ramcharitramans daily from 9.00am -12.00pm, which culminated in grand worship on April 27th midday celebration with birth of Lord Sri Rama. March 2, 2007 morning Sri Swamiji Maharaj was invited for Award distribution Ceremony at "Sri Satsangi Saketdham" Education Institute, WADSMA. Pujya Swamiji inspired graduates by his convocation speech and awarded degrees as well as Diplomas to the students of Master of Education, Bachelor of Education, Primary Teacher Training and Bachelor of Physical Training. Visit to Mogri (March 2, 2007 - Mar 4, 2007) Swamiji joined devotees of “Brahmajyot” gathered to celebrate Sri Bhagatji Maharaj and Sri Jashbhai Saheb’s happy birthday at Mogri, Vidyanagar. Sri Sahebji is a wonderful soul with purity, love and kindness. To be with him is to be with the realized soul. 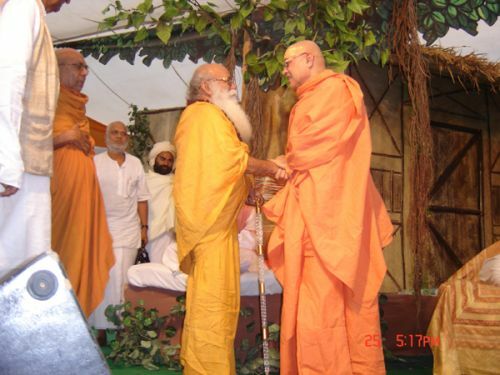 On March 7, 2007 Sri Swamiji Maharaj was invited for re-installing the deity, Sri Bhimashwar Mahadev, at Khed- Brahma. 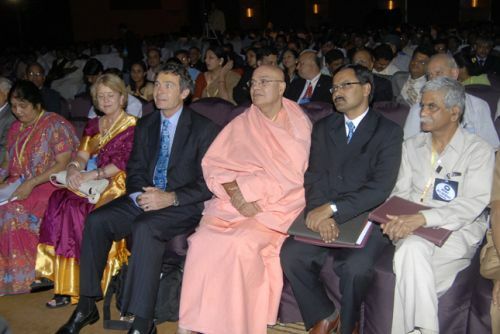 Visit to Delhi (March 8, 2007 –march 9, 2007) Sri Swamiji Maharaj was invited at the function arranged by Art of Living Institutes of Sri Sri Sri Ravi Shankarji Maharaj. It was a get together meeting of ‘Dalit – Savarana’, where the issues and problems of caste system and value of human rights were addressed. 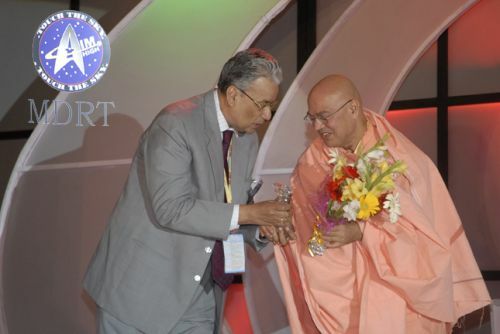 At Lucknow (March 10, 2007 to March 14, 2007) Honoring sincere and generous invitation of Indian Medical Association and King George Medical College Illumini association, Sri Swamiji visited Lucknow. In loving memory of Dr. M. K. Goyal, renowned orthopedic surgeon of Lucknow, a series of discourses were organized by IMA, Lucknow. Dr. C. G. Agrawal, MLA presided over the function. Dr.Anil Srivastava (cardiologist), Dr. Rajesh Kashyap (nephrologists) were the chief organizers of Swamiji’s programs in Lucknow. Wide media coverage was given to all the programs of Swamiji in Lucknow. All India Radio, Door Darshan recorded Sri Swamiji’s interview. 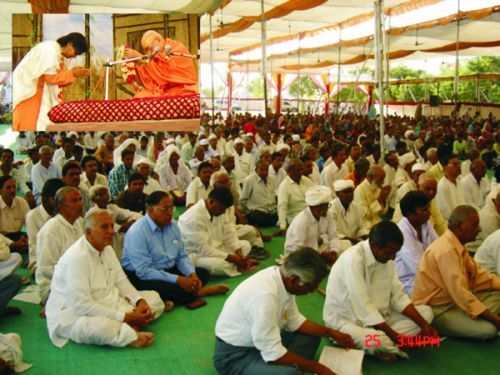 On March 19, 2007 Sri Swami Adhyatmanandaji Maharaj presided over a grand gathering to felicitate Maha Mandleshwar Sri Swami Satya Mitranandaji Maharaj of Haridwar, (Bharat Mata Temple) at Sanand. Devotees were overwhelmed with joy and enthusiasm. Late evening Sri Swamiji accompanied by a group of devotees went to Sarangpur to attend Lord Sri Swami Narayana’s 227th Birth Anniversary in holy presence of H. D. H. Sri Pramukh Swamiji Maharaj. Divine Darshan of His Holiness is a blessed occasion indeed for all. 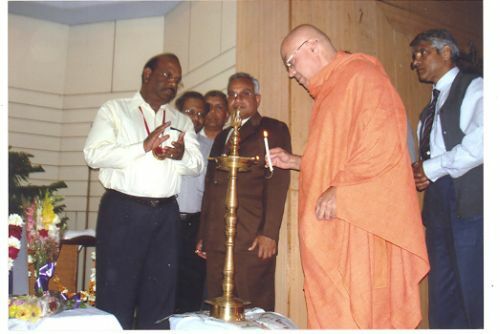 On March 25, 2007 Sri Swamiji Maharaj was invited at Kamasa, Visnagar on the occasion of inauguration of renovated Sri Ram Mandir and community hall for the socio- religious activities. In the afternoon Sri Swamiji Maharaj presided over a Grand Jnana Yajna organized by Sri Maa Kanakeshwari Deviji, in Holy presence of Sri Barfani Babaji, saint who resides normally beyond Kailas in the Himalayas. 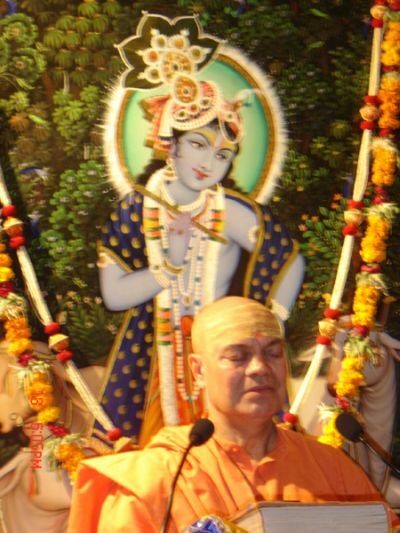 On March 28, 2007 Sri Swamiji Maharaj attended holy occasion of beginning of Sri Ram Katha at Sri Mahamandleshwar Vishwambhar Bharatiji's Ashram, Sarkhej. 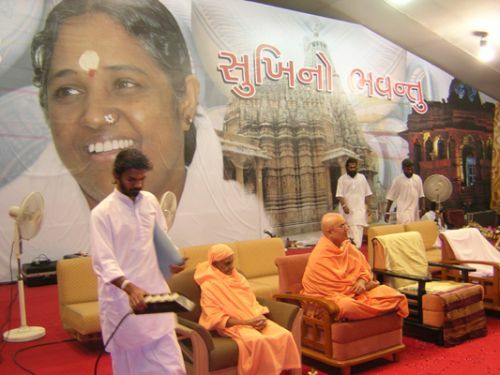 On March 30, 2007 honoring kind request of Smt. Vishaka Maulesh Pota, President Interaction Nagar Mandal, Mumbai, Sri Swamiji Maharaj was the Chief Guest of Fund Raising Program for Communities, Poor Children’s Education Fund and Medical Aid Fund. A renowned artist and a singer Sri Jagjit Singh won the heart of everyone with his melodious music at this function..